"A-huff-and-a-puff-and-a-huff-and-a-puff-and-a-huff-and-a-puff" "WHAT'S HAPPENING?" Tacky the penguin wants to know. The Winter Games, that's what's happening. And Tacky and his fellow penguins Goodly, Lovely, Angel, Neatly, and Perfect have to work hard to get in shape so they can represent Team Nice Icy Land in the athletic competitions. After rigorous training, they're ready - but are the games ready for Tacky? Will his antics keep Team Nice Icy Land from winning a medal? From bobsledless racing and ski jumping to speed skating, Tacky lends his unique, exuberant style to each competition. 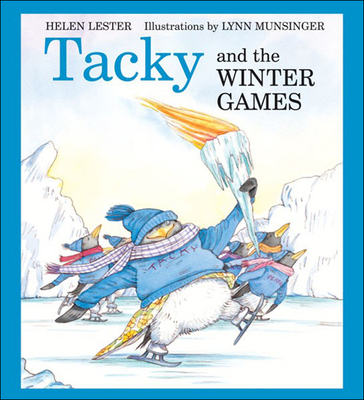 In laugh-out-loud scenes of Tacky and his fellow penguins' athletic debacles, Tacky reminds readers of the underlying joy and enthusiasm that propells athletes to greatness. So get ready to cheer for Team Nice Icy Land and let the games begin.